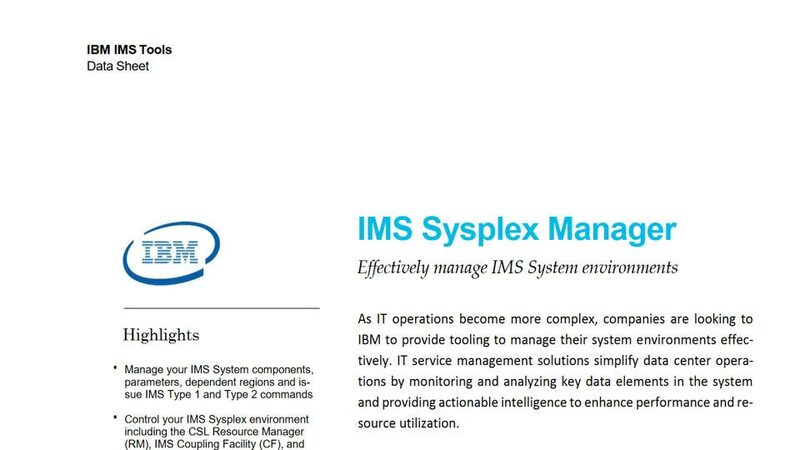 IMS™ Sysplex Manager for z/OS® is a single point of control for IMS system operations. It enables you to manage multiple IMS systems in a sysplex or IMSplex environment. It provides a real-time and centralized display of IMS sysplex and IMSplex information through a single interface and automates the handling of specific error situations reducing complexity for system programmers. IMS Sysplex Manager provides a dashboard feature that allows you to monitor the health of IMS systems. You can use the dashboard to see critical data from key areas, including alerts that indicate when user-defined thresholds are exceeded. Monitor and manage components, parameters, and dependent regions, and issue IMS Type 1 and Type 2 commands. Keep on top of the CSL Resource Manager (RM), IMS Coupling Facility (CF) and IMS Shared Queues structures. Build a custom dashboard that enables you to check the overall health of your IMS systems at a glance. Record command input and output messages from all sources – together with MTO messages – in the same history database. Affinity routing gives you more control over where transactions should be processed. Get direct control over the shared message queue workload balance to better manage availability.